The Connexys Resource Manager version 5 Winter '16 Release will start in 2016 and contains new features and improvements on existing functionality. This article is an overview of the most important improvements. Extended articles for specific topics can be found at specific pages. Some of these will be added later. For a demonstration and explanation of several of the new functionalities, you can view this webinar (which is in English). Browse Job Applications in the Applicant Tracking overview and make (group) Steps . One of the foremost new features in this release provides browsing within the grand overview of filtered job applications in various workflows of the Applicant Tracking. This selection can range from a single job application to a complete group of various job applications. A new (group) step can be selected for the group, or for selected individuals within the group. This creates more speed, control and overview processing the job applications. Match Candidates and Jobs with the new Job Search. With a range or a set of criteria this functionality will help you to find and match the right candidate for the right job. Selected jobs can easily be shared with selected candidates. Also possible to create applications from this screen, or send job by email to contacts. b. Indexing jobs in the application, and Indexing jobs and candidates with special attributes. With this Match-functionality you can search from Textkernel Candidate Search in your own jobs database and Jobfeed. 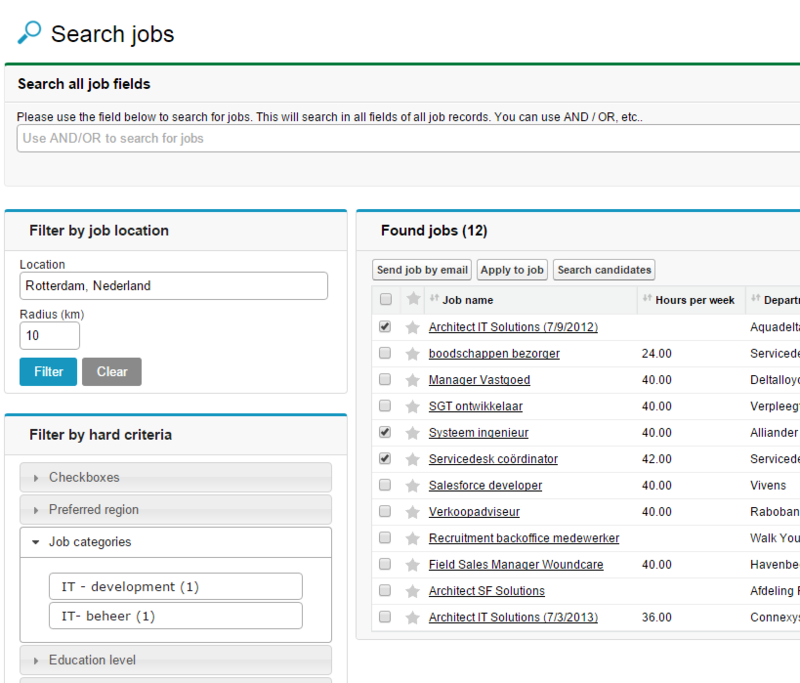 And from Textkernel Job Search you can search in your own candidate database and other search tabs. A query is constructed combining CXS-data (e.g. Location, Hard criteria) plus Jobfeed-data (e.g. Function title, Skills, etc.). 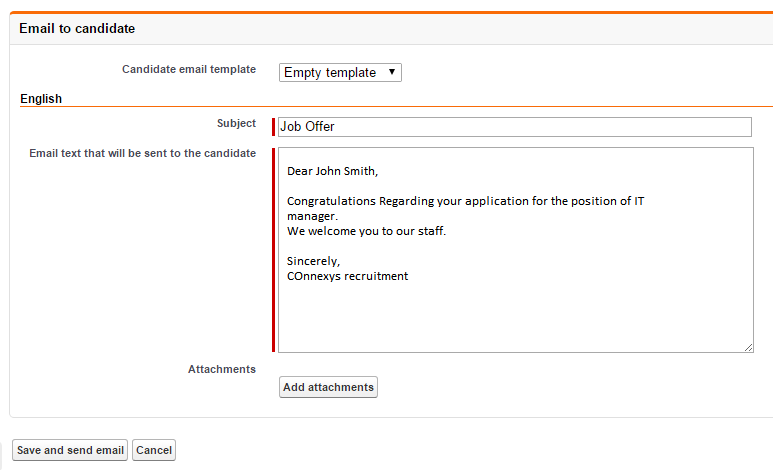 To extend the CO-Recruiter application with this feature, please contact Connexys Support. This Match functionality is developed by Connexys. Textkernel has developed its own Match!. Users who will run this functionality can read here more. Rate job applications including a memo. With job applications rating including a memo, it is easy to keep track of candidates which are already viewed. The rating can be edited live, and supports recruiters in the process, for example to distinct individual applications within groups or share and discuss applications with others. With new styling, the apply form will adjust to the device. No matter what size your device, the form will adjust the height and width to the screen, but will remain content fitting the size of your device. This increases readability and ease of use. Note: to implement this, contact Customer Support for consultancy hours. Automatically finding the location for open applications. This new functionality helps to find the right recruiter for the application. For example to automatically select the recruiter nearest of the job application specially set for jobs that spread in a wide area, the recruiter is automatically selected based upon location of the job application. We now fully support Slovak as common language in our language pack. Next to Dutch, English, German, and French. Find the language application settings in the Translation Workbench. The Matching screen for Jobs to Candidates has been removed. This replaced by the more improved functionalities regarding matching; see the Textkernel Job/Candidate Search, as well as the new Job/Candidate Search. Error message on the form. The date field check the correct date format, regarding dd-mm vs. mm/dd for the corresponding language (see Fixes #1144). The wrong format gives the user a direct error on the field. General error message. The new message reads: "An unexpected error has occurred. Sorry for the inconvenience, but an unexpected error has occurred. Please try again at a later moment. Please email us [goes to customer administrator] if you need to get in touch"
The Workflow Overview on the Home Page is set to view each Workflow record type among each other. In stead previously selecting each Workflow via a drop down menu, you have a clear overview on all workflows all the time. 0817 - Sorting applications list by workflow for better overview. 0817 - Propose date in red after set days, to alert the manager. 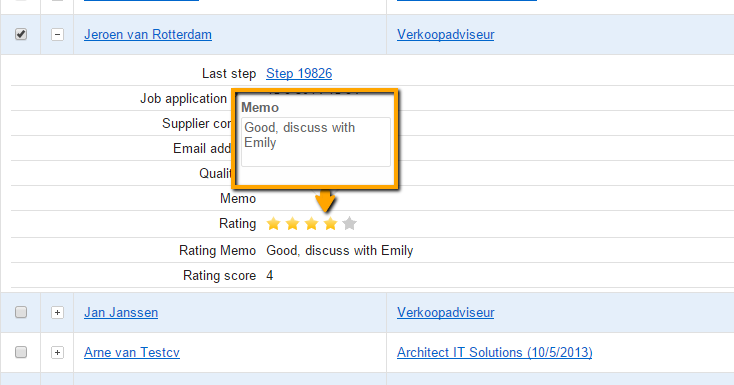 1076 - Document preview within HM portal. 1176 - Show field set of permanent job type. 1203 - Show Company Information correctly. 1207 - Push edited start- and end date from HM Portal. 1180 - New-procedure-check on candidate 'waiting list'. 1286 - Process in batches, including set-up in application setting. 1144 - Date format check on [mm/dd/yyyy] vs. [dd-mm-yyyy] for corresponding language. Each customer that has reported a bug which resulted in a planned fix, will always receive a final update when that fix has been tested as 'good', including when this will be patched or released.